Qeshm Fars Air, an Iranian civil aviation company, is suspected of smuggling arms into Lebanon, destined for the militant group Hezbollah and Iranian weapons factories. An Iranian civil aviation company is suspected of smuggling arms into Lebanon, destined for the militant group Hezbollah and Iranian weapons factories -- and western intelligence sources said Monday they've uncovered the unexpected routes that Iran apparently took to try avoiding detection. The sources identified two rare and unusual Qeshm Fars Air flights from Tehran to the international airport in Beirut during the past two months. The first flight, on July 9, involved a Boeing 747 that departed from an air force base in Tehran, stopped for a short layover at the international airport in Damascus, Syria, and then continued with a rather “uncharacteristic flight path” to the Beirut international airport, where it landed shortly after 4 p.m. local time. Western Intelligence sources claim the airplane carried components for manufacturing precise weapons in Iranian factories inside Lebanon. The U.S. and Israel, as well as other western intelligence agencies, have supplied evidence that Iran has operated weapons factories in Lebanon, Syria and Yemen. Last week, citing Iranian, Iraqi and Western sources, the Reuters news agency reported that Iran had transferred short-range ballistic missiles to its Shiite allies inside Iraq in recent months. Tehran and Baghdad formally denied that report. The second flight was conducted on August 2. Flight number QFZ9960 landed in Beirut at 5:59 pm, after departing Tehran's international airport two and a half hours earlier. This time, the plane did not stop in Damascus, but it followed a slightly irregular route north of Syria. 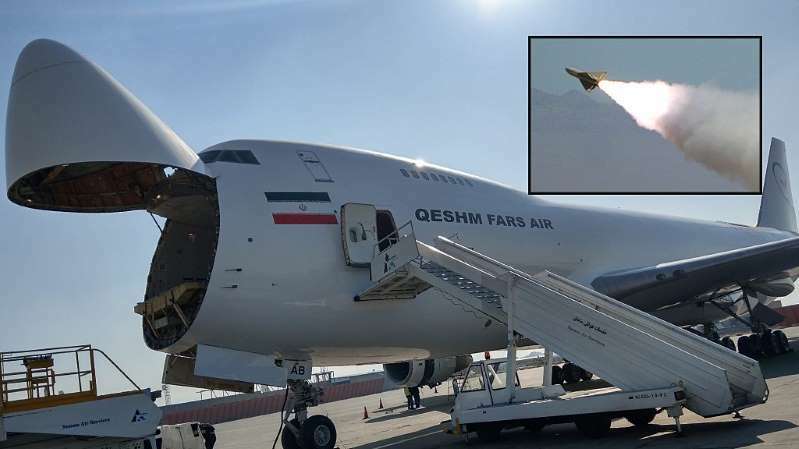 Qeshm Fars Air is considered one of the various pseudo-civilian airlines used for arms-smuggling by the Islamic Revolutionary Guard Corps (IRGC) and the elite Al-Quds force led by Qassem Soleimani. Back in October 2017, President Trump imposed sanctions on the IRGC and the Al-Quds force. The airline had ceased operations in 2013, citing poor management, but restarted under new management in March 2017. It it said to have two Boeing 747s in its fleet. Among the members of the company’s board are three IRGC representatives: Ali Naghi Gol Parsta, Hamid Reza Pahlvani and Gholamreza Qhasemi. The United States is Lebanon’s primary security partner, according to the State Department. Since 2006, the U.S has provided Lebanon over $1.7 billion in security assistance, in part to counter Hezbollah’s influences. Hezbollah is considered a terror organization by many U.S. officials and other western countries, and is backed and funded by Iran.